This is honestly my favorite car and I will love it until the day I die. Before I had this Subaru I didn't really believe all those commercials (you know the ones, where the Subaru stays with the family through years or decades of children growing up, etc). And I bought this car already used from a friend who'd had it since she was a baby (it was a family car until she got her driver's license, where her parents bought a new Subaru and left her the old one) and it's been a few years of road tripping (I regularly travel to Los Angeles and up and down the Pacific Coast highway) as well as regular everyday use in college and for work. It is such a reliable car even after almost two decades of use. I highly recommend this car. My only issue is that some of the tint on the back side windows is starting to peel. Simple yet sleek adventure car! 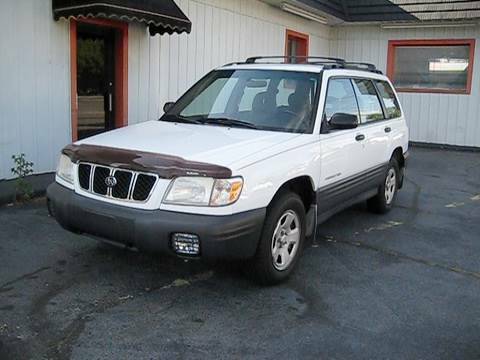 I have absolutely loved my Subaru Forester. It has been through 3 other reckless teenagers and is now owned only by me and my husband. There are a few scratches and dents, but it runs absolutely amazing! I had a problem with my engine awhile ago and it was fixed within a week for a decent price which was also nice. From the second I sat in my Subaru, I considered myself a diehard Subaru fan. They are great long-lasting, well-priced cars that are both family friendly and adventure worthy! The Forester that doesn't quit, and is prettier on the inside:). We bought this car used from a dealership so it was already a little beat up. I'd have to say that the worst things are mostly cosmetic, like two of the temperature/fan control knobs are broken so you have to switch between them to be able to change the amount of air that comes out. The air conditioner also pooped out, and I wonder if that is the case with just this car, or is a thing with Foresters. Otherwise the car runs pretty well for its age. A trooper.